A week after Valentine’s Day, ASP Trustee, Ms. Carmel Almendrala, received an invite from Fr. Luke Moortgart, Executive Director of Catholic Handicap Development (CHD). 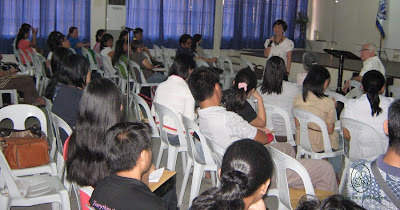 The said convention was held last February 20 at Paco Catholic School. Yearly, the Special Education Assistance of CHD organizes a free “Special Education Convention.” Personal experiences from speakers inspire and encourage parent participants of children with special needs. She talked about how they coped with the word autism, knowing that during their time, autism was a foreign word to them. Their family’s journey wasn’t easy, but now, Mike earns his place as a permanent employee in the Philippine Information Agency. “It meant acceptance by the mainstream society of his existence as an individual who claims the same rights and obligations of a citizen of our country. It also serves as recognition, that a person with autism can contribute his own share to his community,” said Tita Carmel. Other speakers Ms. Maria Cristina Belen, SpEd Educator; Ms Leticia Martin, In charge Profession in Special Education and Ms. Nancy Pascual, Senior Education Program Specialist; provided teachers and interested parties new insights in assisting, understanding and supporting the children with special needs. ASP works hard together with more Autism Angels for a brighter tomorrow. 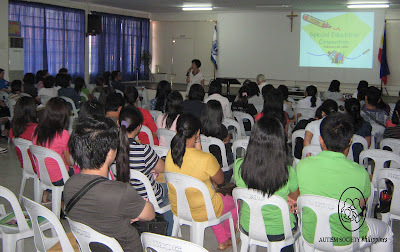 On February 27, Teacher My Sorongon will talk about Siblings of children with disabilities. Interested parties may call 521 5876 to book a slot. The book “Concerns of Adult Siblings of Persons with Autism” talks about the different challenges siblings of CWAs face and how they coped with their sibling’s diagnosis from childhood to adult life. 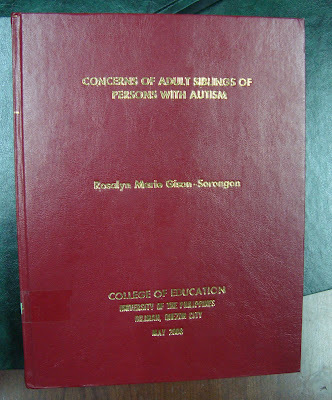 Visit the ASP library at room 307, #47 Kamias Road QC or call 929 8447/ 926 6941 for more information. Write us at autismphil@pldtdsl.net to request for Understanding Autism seminar in your schools or institutions.